What Can I Do With a BSN Degree? What Will I Learn in My RN to BSN Program? Advancements in technology and medicine have made the healthcare field more effective, which has led to a demand for qualified nurses. The Bureau of Labor Statistics projects employment for registered nurses to grow 16% between 2014 and 2024, which is much faster than average. Nursing is a challenging field that requires in-depth knowledge of healthcare practices, including empathy and communication skills to work with patients, family members, and other healthcare professionals. If you’re already a registered nurse but interested in expanding your career options, an RN to BSN online program is a practical option that allows you to continue working in healthcare while simultaneously gaining the skills to advance your career. The schools on this list offer some of the top online RN to BSN programs in the country, giving you a quality education that will increase your earnings potential without exorbitant tuition costs. Additional Considerations Applicants must possess current nursing licensure and either an associate degree or diploma in nursing. Many programs also include clinical practice requirements. North Dakota's MSU provides students with a rigorous, pragmatic, and affordable educational experience. The school's 122-credit RN to BSN functions as a fully online completion program that distance learners can finish in either two or four semesters. The program builds upon the knowledge and skills of registered nurses to enhance delivery of quality care, improve communication skills, incorporate research into evidence-based practice, and employ critical thinking and problem-solving skills. Distance learners can complete required clinical experience in their local area. MSU permits students to transfer up to 60 credits from a four-year institution toward their RN to BSN online. Admission requirements include an active RN license and a minimum 2.75 GPA in undergraduate coursework. Additionally, applicants must pass a criminal background check and submit evidence of certain immunizations. FSU features a diverse population of approximately 6,000 students. The school's 120-credit, affordable RN to BSN online program appeals specifically to RNs with an associate degree or nursing diploma. Graduates leave the program able to synthesize empirical knowledge, incorporate economics and social justice principles to improve healthcare access, and use evidence-based best practices in healthcare delivery. Available through the Canvas Learning Management System, online course content covers a variety of topics including transcultural nursing, health assessments, gerontology, and pathophysiology. FSU allows students to transfer up to 32 credits from an associate degree in nursing. Application requirements include a minimum 2.8 GPA on previous undergraduate coursework and a passing score on the Kaplan Nursing Entrance Exam. Applicants must also clear a criminal background check and drug screens to be eligible for admission to FSU's nursing program. A progressive, entrepreneurial university, FHSU boasts a catalog of 40 online degree programs. Approximately 6,000 students receive instruction through the school's Virtual College, with nursing among the top 10 undergraduate programs. Catering to cost-conscious and busy learners, FHSU's cheap RN to BSN online does not require any in-person participation. Areas of study in the program include evidence-based research, nursing transition, ethics, health assessments, and pathophysiology. To earn their degree, distance learners must complete at least 120 credit hours while maintaining a GPA of 2.5 or above. Admission requirements include an active RN license and a minimum 2.5 GPA. Applicants must also pass a background check. FHSU accepts transfer credits from a number of community colleges around the country. Additionally, the school's tuition ranks among the lowest 2% in the country. ECU’s catalog of more than 40 online degrees in a comprehensive range of majors makes it North Carolina’s leader in distance education. The school’s online undergraduate programs all enable degree completion, including a 33-credit RN to BSN. Required coursework for the entirely online program focuses on research, clinical scholarship, and evidence-based practice; community health nursing; nursing leadership and finance; and nursing in a global society. Distance learners can earn their degree in four semesters. Admission requirements for ECU's RN to BSN online include prerequisite coursework, which students can complete through the university or transfer from a four-year institution with a grade of C or better. Applicants must also have an associate degree or diploma in nursing along with an active RN license. Currently, online learners residing in Alabama, Massachusetts, Minnesota, Maryland, and Ohio cannot enroll in this program. Featuring an engaged and supportive community of learners, WCU offers 120 undergraduate degrees and minors. The school's distance learning options include an affordable RN to BSN online that students can complete in two years. Available only in a part-time format, the program requires 24 hours of online core coursework and 8 hours of online electives. The curriculum includes blocks of courses in leadership and community health. To earn their degree, students must also complete two sets of practicum rotations, and can do so within their local community with instructor approval. WCU's program stands out among online RN to BSN programs for student pass rates that exceed the national average on licensure or certification exams. With start dates in the fall and spring, prospective students should submit their applications by March 10 and September 10, respectively. Delivering more than 50 online degree and certification programs and 600 distance learning courses, UWF boasts a strong online presence. These offerings include an affordable, 124-credit RN to BSN. The school's fully online RN to BSN program accepts currently licensed RNs who hold an associate degree or have completed the program’s general studies requirements. As they progress through the curriculum, nurses become well-versed in various factors that affect health care, such as socio-economics, culture, and politics. The program also develops students’ skills in critical thinking and communication. Coursework covers topics like health assessments, nursing systems management, gerontology, and evidence-based nursing practice. Degree candidates can complete the program's required clinical component in their local area. Nonresidents may apply for a tuition waiver that substantially reduces costs. The affordable RN to BSN online features start dates in the fall, spring, and summer. Learners at SUNY Plattsburgh enjoy access to high-quality curricula and hands-on learning opportunities in classes with an average student-to-faculty ratio of 16-to-1. One of the best hybrid RN to BSN online programs available today, the school's RN to BSN requires degree candidates to complete 120 credits. With a focus on biological and behavioral sciences, the program also covers nursing informatics, health assessments, global issues, public policy, and leadership and management. Experiential learning serves as an integral part of the program, and students can fulfill clinical requirements in their local community. SUNY Plattsburgh delivers the program in an accelerated cohort format that part-time learners can complete in under three years. Full-time students can earn their degree in less than two years. Additionally, the university permits degree candidates to transfer a maximum of 34 credits of nursing courses toward their RN to BSN online program. Application requirements include RN licensure, an associate degree or nursing diploma, and a minimum cumulative 2.5 GPA on courses completed at another regionally accredited institution. Each year, ASU's virtual campus serves about 1,200 distance learners earning degrees in disciplines like child development, education, and nursing. Students can complete the school's affordable RN to BSN online through an accelerated, part-time format in one year. To earn their degree, distance learners must complete 124 credits in sciences, humanities, mathematics, and English composition. ASU features a generous transfer policy, requiring only that students complete 30 credits through the university. Admission requirements include an associate degree or diploma in nursing from a regionally accredited institution and RN licensure in North Carolina or a compact state. Applicants should also have a minimum cumulative 2.5 GPA. Prospective students must submit their applications (along with a nonrefundable fee) by April 1 for the program's only start date in the fall semester. USD’s virtual campus offers 40 programs in fields ranging from business and education to healthcare. The school's affordable RN to BSN program, catering to those with an associate degree or diploma in nursing, features three completion tracks: a two-semester, full-time fast track; a four-semester, part-time traditional track; and a one-course, part-time progressive track. Areas of study include information management; evidence-based practice; nursing role synthesis; and policy, finance, and regulations. Degree candidates must earn 120 credits to complete the program. As with many RN to BSN online programs, USD permits students to transfer in credits from a regionally accredited program. Though they can transfer up to 90 credits, distance learners must complete 30 credits through USD. Students can arrange to complete the clinical portion of the program at their place of work or elsewhere in their local community. The school's program boasts an affordable tuition rate for all distance learners, regardless of residency status. Established in 1884 as a women’s college, MUW now delivers more than 50 majors and minors to both men and women. The school's eLearning opportunities include an RN to BSN Advanced Placement Option for RNs with an associate degree or diploma in nursing and 50 credits of prerequisites. Notable among RN to BSN online programs, MUW's degree offers a fully online option in addition to a hybrid option that combines online learning with classroom study. Coursework covers a variety of topics like health promotions, leadership and management, pathophysiology, evidence-based nursing practice, and complex health challenges. MUW offers a full suite of financial options to distance learners, including federal loans and grants. Residents of Alabama, Arkansas, Louisiana, and Tennessee may qualify for in-state tuition if they meet admission and academic standing requirements. NCCU endeavors to produce global citizens and community leaders through acclaimed programs in fields such as business, education, and the sciences. Located in the state's research triangle, the school also works to advance research in areas like biotechnology, biomedical, and health sciences. NCCU’s robust eLearning programs include a 22-credit RN to BSN program for RNs with an associate degree or diploma. Full-time students can earn their degree in just two semesters, while part-time learners can complete the program within two years. Applicants to the program must first complete all general education requirements in addition to a bridge course to be eligible for admission. NCCU delivers upper-level courses fully online in both synchronous and asynchronous formats. As with other RN to BSN programs online, other admission requirements include an RN license and a GPA of 2.5 or above. Featuring one of the largest virtual colleges in Illinois, USF enrolls more than 1,500 online learners each semester. A Catholic institution rooted in the liberal arts, the school helps students grow intellectually and professionally through nationally ranked programs in various fields, including nursing. USF's degree completion RN to BSN emphasizes skills in decision-making and critical thinking. Available fully online, the program includes one-on-one advising and mentorship from experienced faculty who hone nurses’ clinical expertise. Study areas include informatics, health policy, managed care, and hospice care. USF's RN to BSN online covers both theory and real-world applications to reinforce concepts and fine-tune skills. USF accepts transfer credits from two- and four-year institutions. To be eligible for admission to the nursing program, applicants must have a cumulative GPA of 3.0 or above. Additionally, all those who qualify must earn a minimum score on the Test of Essential Academic Skill (TEAS). A historically black institution, WSSU features a diverse academic community and rich liberal arts curricula that promote creativity, problem-solving skills, and character development. The university offers an RN-BSN Outreach Option that requires students to complete just 35 credits in the nursing major. Full-time learners can earn their degree in 12 months, while part-time students can complete the program within two years. Areas of focus in the curriculum include health assessments, caring for older adults, leadership and management, and community health nursing. Admission into WSSU's RN to BSN online requires an associate degree in nursing or nursing diploma, a minimum cumulative 2.6 GPA, and current license to practice in North Carolina. The school may grant advanced placement to paramedics and those with an associate degree admitted into the program. Students must complete a total of 128 credits to earn their bachelor's degree. UTPB offers a variety of academic programs both on campus and online. The school's affordable RN to BSN ranks among accelerated online RN to BSN programs that students can complete in 12 months. With all course content available online, the program features eight-week classes and multiple start dates throughout the year. As they progress through the curriculum, degree candidates explore topics like transcultural nursing, clinical leadership, multicultural public nursing, and business and ethics. Note that the 31 credits comprising UTPB's RN to BSN online focus on upper-division nursing education; students will need to transfer in general education and lower-division nursing courses in order to meet the 120-credit threshold for graduation. Applicants must have a minimum 2.0 GPA to seek unconditional admission to the program. Top-notch educators deliver world-class academics at BSU, ranked one of the best institutions of higher learning in the Midwest. The school’s affordable RN to BSN requires students to complete 120 credits and 180 hours in a clinical setting. Distance learners can earn their degree full-time or part-time, completing coursework online in an asynchronous format. The curriculum covers a range of subjects, from research in nursing to management and leadership. Admission requires an associate degree, RN license, and a minimum 2.75 cumulative GPA. Generally, nurses transfer at least 30 credits into the program. BSU stands out among RN to BSN online programs due to its Simulation and Information Technology Center, which provides clinical simulation opportunities and technology support. Other services available to distance learners include online advisors and access to student ambassadors. ENMU emphasizes the liberal arts, inquiry, and cultural diversity. Featuring a robust virtual campus, the school delivers more than 30 degree options in fields ranging from business and education to information systems and nursing. ENMU offers a RN to BSN as an exclusively online completion program. The curriculum functions to enhance nurses’ clinical practice techniques, improve their critical thinking skills, and heighten their experiential awareness. Coursework in the major includes study of health assessments, women’s health care, community health nursing, and nursing leadership. Admission into ENMU's RN to BSN online requires a current RN license and college transcripts. A rarity in RN to BSN online programs, the school's Surface tablet loan program allows students to save on technology costs. Additionally, degree candidates who meet specific criteria, including a minimum 3.25 GPA, can take advantage of various scholarships. UNCW has been training exceptional nurses for more than 40 years. The university's 31-credit RN to BSN enhances the knowledge and skills of RNs as the curriculum prepares them for administrative, research, clinical, and teaching positions. One of the RN to BSN online programs that students can complete in as few as 12 months, UNCW's degree requires students to complete a minimum of 31 credits through the university. Degree candidates explore a variety of topics such as health assessments, gerontology in nursing, health policy, and transcultural health care. Admission requirements include a minimum 2.5 cumulative GPA, an associate degree or diploma in nursing, valid nursing licensure, and at least 24 transferable credits. 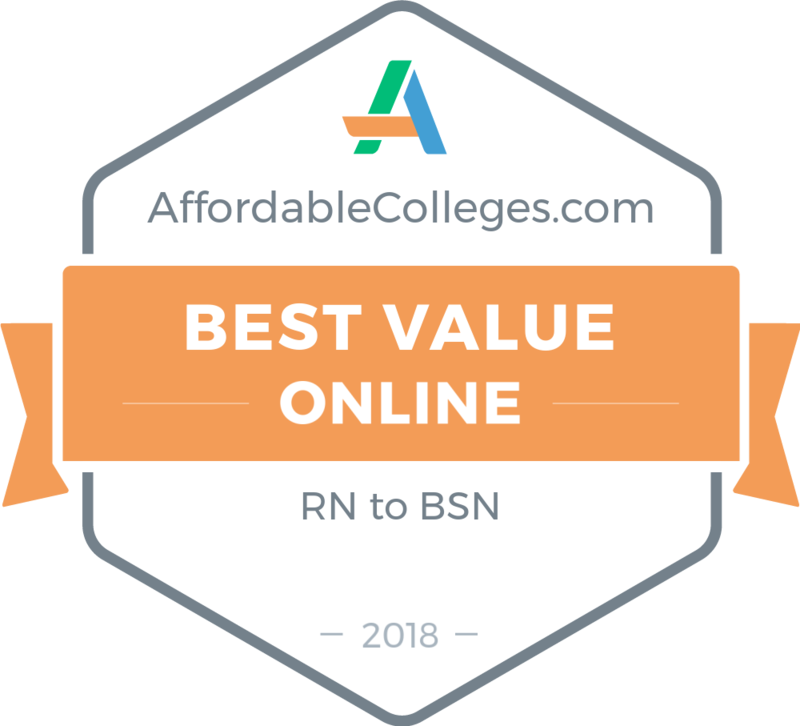 Students seeking a cheap RN to BSN online should consider UNCW's program and the various financial aid options available through the university. Students in U of M's RN to BSN online program develop the skills necessary to provide high-quality nursing care; incorporate evidence-based research, informatics, and technologies; implement health promotion strategies; and become well-versed in the socio-economic, cultural, and political factors that impact healthcare delivery. Areas of study within the curriculum include transitioning into nursing practice, health assessments, pharmacology, and community nursing. U of M offers a variety of services to distance learners like academic advising and career preparation assistance. Established in 1884, NSU dedicates its resources to teaching, research, and service. Additionally, the school commits itself to distance learning through the state’s first and most comprehensive virtual campus. Among NSU's 39 online degree options, an RN to BSN functions as a completion program for RNs with an associate degree or nursing diploma. Degree candidates can complete thirty hours of nursing courses (in addition to general education courses) fully online and may fulfill clinical requirements in their local community. Admission requirements include a minimum 2.0 GPA and an unencumbered RN license in the state where the student will complete clinical requirements. NSU awards transfer credits on a case-by-case basis, and grants 31 credits for lower-level nursing requirements to graduates from National League for Nursing accredited programs. The school's competitive tuition rates, with no extra costs for out-of-state distance learners, place its degree among cheap online RN to BSN programs. A research institution, NMSU serves 15,000 students at five campuses, dozens of extension offices and service centers, and through distance learning. Consisting of 128 credits, the school's RN to BSN caters to RNs who have earned an associate degree or nursing diploma. The curriculum includes general education requirements and requires students to earn an additional 39 credits in upper-division nursing courses. Degree candidates can complete the program in just two semesters and a summer session. Admission into NMSU's RN to BSN online requires a current New Mexico RN license, a minimum cumulative 2.5 GPA, and certain prerequisite coursework. The university awards transfer credits on a case-by-case basis, including a maximum of 41 lower-division nursing credits. Resources available to distance learners include a technology helpdesk. Established in 1903, MCCN has locations in Columbus and Lancaster, Ohio. A leader in nursing education for more than 100 years, the school delivers a fully online, 30-credit RN to BSN that gives admission priority to qualified applicants who are graduates of ACEN nursing programs. The curriculum integrates the liberal arts, humanities, and sciences as it immerses students in evidence-based nursing instruction. MCCN’s program includes study of informatics, health assessments, transcultural concepts, and caring for the elderly. Full-time students can earn their degree in four semesters, but the program also accommodates part-time learners. Admission requirements for the RN to BSN online include an unencumbered nursing license, 52 credits in general education, a minimum 32 credits in nursing courses, and a minimum 2.0 GPA. MCCN offers start dates for this degree in the fall, spring, and summer semesters. Located in South Carolina, AU provides students with top-tier education in a comprehensive range of disciplines both on campus and through distance learning. RNs returning to school can earn a baccalaureate degree online with the school's RN to BSN program. As they progress through the 120-credit curriculum, students develop advanced nursing competencies, leadership skills, and healthcare management techniques. AU’s RN to BSN plan consists of 31 credits of study in areas like role transition, research in practice, health assessment, and leadership management. Degree candidates can transfer up to 40 credits earned in pursuit of an associate degree in nursing. Unlike many other RN to BSN online programs, AU's degree boasts flexibility and permits students to take as many or as few credits as fits with their schedule. Additionally, the program features rolling admissions and courses as short as five weeks. Applicants should have a nursing license and an associate degree with a cumulative GPA of 2.75 or above. GSW offers a range of bachelor’s degrees, including a nursing program catering to both full-time and part-time students. Distance learners typically complete the school's affordable, fully online RN to BSN in one or two years. Requiring degree candidates to complete five non-clinical courses and two clinical classes, the curriculum also includes a mandatory practicum. Students must complete 61 credits of nursing courses to earn their RN to BSN online, covering subjects like health assessments, gerontology, leadership, and community health nursing. Additionally, learners must earn 61 credits in general education classes. Prior to clinical work, all students must complete a background check and drug screen, in addition to providing evidence of certain immunizations. Admission requirements include a Georgia nursing license. With start dates in the fall, spring, and summer, prospective students must submit their applications by July 15, November 15, and April 15, respectively. Directly affiliated with The Church of Jesus Christ of Latter-day Saints, BYU-Idaho provides a learning environment where students receive a rigorous education while strengthening their faith. Qualified registered nurses can enroll in the school's RN to BSN program and earn their degree in 3-6 semesters. The university promotes several core values throughout the curriculum, including stewardship, professionalism, and caring. Courses in the program include pathophysiology, nursing research, community nursing, and nursing leadership. Distance learners can access all content online in an asynchronous format. Admission requirements include a minimum 2.5 GPA and annual ecclesiastical endorsements. BYU-Idaho permits students to transfer up to 46 credits from an associate degree or nursing diploma in nursing into their RN to BSN online. The university offers the program during each semester. EKU delivers around 110 degrees at six campuses and through distance learning. The school offers an RN to BSN fully online as an accelerated program for working nurses seeking to enhance their credentials. By enrolling in two classes per eight-week term, distance learners can earn their degree in just 12 months. However, most students take two years to complete the program. Application requirements include an associate degree in nursing, an RN license, and a minimum 2.5 GPA. EKU works to keep tuition affordable and features one flat tuition rate for distance learners regardless of state of residence. Prospective students should submit their applications for this cheap RN to BSN online by July 1 for fall, November 1 for spring, and March 15 for summer. Serving more than 7,000 students, UNA boasts a student-to-faculty ratio of 17-to-1. The university's College of Nursing produces graduates who are leaders in innovative healthcare through several programs, including an online RN to BSN. Full-time students can earn their degree in just one year. Areas of study include health and physical assessments, nursing research, leadership and management in nursing, and quality and safety. UNA permits students to complete coursework asynchronously and transfer up to 30 credits for prior nursing education. With permission, degree candidates can fulfill clinical requirements within their local community. Additionally, the university waives non-resident fees for distance learners, making this a cheap way for students to earn an RN to BSN whether or not they live in Alabama. Distance learners from certain states — including California, Hawaii, and New Jersey — cannot currently enroll in this program; if you are out-of-state, check with UNA’s department to make sure you are eligible to apply. A nationally ranked research institution, UMass Amherst offers 112 degrees in a variety of disciplines. The school's RN to BSN enhances learners' healthcare expertise, develops their leadership skills, and fosters exploration of new practice areas while providing the credentials students need for career advancement. Degree candidates must earn 120 credits to complete the fully online program, and can do so in as little as one year. The university may award up to 30 credits for RN licensure. Coursework in UMass Amherst's RN to BSN online involves community-focused nursing, underserved populations, health and physical assessments, and a special populations practicum. Admission requirements include a current RN license, 60 general education credits, and a minimum 2.5 GPA. The school offers a suite of financial aid options, including federal loans and scholarships. Serving 15,000 students, TWU has locations in Dallas, Denton, and Houston in addition to an innovative eLearning campus. The school offers a variety of degrees in fields such as liberal arts, health sciences, and nursing. Notably, TWU graduates more professionals in healthcare than any other institution in the state. The school's fully online RN to BSN caters to RNs with an associate degree or diploma in nursing. Upper-division course requirements that students must complete at TWU include nursing assessment, pathophysiology, high acuity nursing, community healthcare, and aging populations. While TWU may award up to 28 credits for unencumbered RN licensure, degree candidates must earn 32 nursing credits through the school. Admission requirements for this RN to BSN online include an RN license, 60 credits (lower-division prerequisites and electives), and a minimum 2.0 GPA. CSU engages students through nationally recognized programs in fields like business, education, and nursing. The school’s approximately 8,000 students enjoy access to a comprehensive catalog of distance learning options available fully online and in a hybrid format. Qualified RNs seeking to earn a baccalaureate degree can enroll in CSU's RN to BSN, which they can complete fully online in just 12 months. Like other RN to BSN online programs, CSU's degree offers flexibility with year-round admission. Students complete classes in seven-week sessions, and can fulfill clinical requirements in their community. Program requirements include 63 credits in core and nursing prerequisites in addition to 60 credits in nursing coursework. CSU features one competitive tuition rate for all distance learners, regardless of residency. Considering the available pay-by-course option, this program functions as a cheap opportunity for students to earn their RN to BSN online. An urban research university, UNC Charlotte delivers exemplary academic programs and provides internationally recognized research opportunities. The school’s catalog of distance learning options includes baccalaureate completion programs in fields such as engineering and nursing. UNC Charlotte's 31-credit RN to BSN allows RNs with an associate degree or nursing diploma to earn the credential part-time in just 12 months. The fully online program involves study of cultural health, health assessments, aging and health, leadership, and community healthcare. Admission requirements for UNC Charlotte's RN to BSN online include an unencumbered RN license and a minimum 2.0 GPA on college transfer credits. The university provides extensive assistance services for distance learners, including a help desk, dedicated librarian, and program managers who provide logistical and other types of support. UL Lafayette's curricula rank among the top programs in the nation in fields such as informatics, computing, nursing, and healthcare systems. The school's 30-credit RN to BSN program asks students to explore nursing theory in decision-making, review scientific findings to implement evidence-based care, and learn to collaborate with colleagues on interdisciplinary teams. Courses in UL Lafayette's RN to BSN online include community health nursing, health and physical assessments, nursing in a disaster, and working with diverse populations. Application requirements include an active RN license, an associate degree in nursing, and a minimum 2.5 GPA. With one tuition for all distance learners regardless of residency, payment plan options, and a full suite of financial aid services, UL Lafayette's program functions as a cheap RN to BSN online. Alfred State delivers students career-focused educational programs infused with the liberal arts. In addition to more than 70 majors, learners enjoy access to distance learning opportunities that cater to the needs of employers in high-demand fields like nursing. The school's two-year RN to BSN focuses on topics such as evidence-based decision-making, applying informatics to foster communication and collaboration, and preparing nurses to assume leadership roles in the delivery of healthcare. Degree candidates complete a professional capstone course as a culminating experience wherein they synthesize their newly acquired knowledge in application to a real-world issue. Coursework in Alfred State's RN to BSN online includes study of ethical issues in healthcare, health assessments, nursing research, and advanced pathophysiology. Admission requirements include 30 nursing credits, 24 hours of general education credits, and an unencumbered RN license. The school offers financial aid options including scholarships and federal loans. Celebrated as a top innovator in education, ASU-Skysong features world-class academics and research opportunities. The school's online offerings span disciplines from business and management to political science and healthcare. ASU Online delivers one of the top online RN to BSN programs in the nation, featuring acclaimed faculty, a variety of online instructional formats, and a completion timeframe of 15 to 18 months. Upper-division nursing coursework in the school's RN to BSN covers a range of topics in nursing research and application, innovation in nursing, nursing management in healthcare, and health promotion. Degree candidates complete a minimum of 30 credits at ASU and can transfer up to 65 credits from a regionally accredited community college. However, Arizona Transfer Pathway students may apply up to 75 credits toward this degree. Admission requirements include an associate degree or nursing diploma, a minimum 2.5 GPA, and an RN license. A metropolitan institution of higher learning located in Virginia, ODU serves about 24,000 students, a quarter of whom are military-affiliated. The school boasts more than 30 years of experience in distance education, offering many of its 120 undergraduate programs through eLearning. Both full-time and part-time distance learners can earn degrees at ODU. ODU's 120-credit RN to BSN functions as a degree completion program for licensed RNs. While students must complete 30 credits through the university, they can transfer in general education credits and other requirements from an associate or bachelor's degree. Upper-division coursework in the program includes study of health assessments, community health nursing, case management, and clinical nursing concepts. Part-time students can earn their RN to BSN online in two years. Currently, distance learners residing in Washington cannot enroll in the program. IU East offers bachelor’s degree completion programs in fields such as health science, informatics, and nursing. The school's RN to BSN equips nurses with the knowledge and skills necessary to meet the evolving demands of the healthcare industry. Graduates leave the program prepared to assume leadership roles and practice in diverse environments such as hospitals, long-term care, and nontraditional settings. Students meet for class sessions online once per week for five semesters. Coursework includes study of health policy, informatics, nursing process, community health, and nursing management. Degree candidates must complete three clinical courses involving community health, management, and a capstone, and can do so within their community. Admission requirements for IU East's RN to BSN online include a minimum 2.75 GPA, an associate degree, and a valid Indiana RN license. Specializing in allied health programming, Baptist College prepares students for leadership roles and lives of service in healthcare. Offering one of the best RN to BSN programs online, the school provides distance learners flexibility with fully online, hybrid, part-time, and full-time enrollment options. Additionally, Baptist College caters to learners from around the country with one tuition rate for all online students, regardless of residency. The school's RN to BSN requires degree candidates to complete a total of 122 credits. However, the school awards 41 credits to students with a nursing diploma or associate degree and experiential credit to nurse leaders, case managers, and public health nurses. Coursework covers subjects like health assessments, pharmacology, pathophysiology, and healthy aging. Admission requirements include an unencumbered nursing license (or eligibility for such licensure), a minimum cumulative 2.5 GPA on college coursework, and an associate degree or nursing diploma. The school offers a full suite of financial aid options to serve as an affordable option for those seeking to earn their RN to BSN online. ULM features a robust virtual college that offers 30 degree programs. These include a fully online RN to BSN that prepare RNs for advanced practice in the healthcare industry. Like most RN to BSN online programs, ULM's degree also equips nurses for management positions in the field. Students must complete 65 credits in the major, and a total of 120 credits to graduate with their degree. Areas of study in the school's affordable RN to BSN online include adult health nursing, evidence-based practice, nursing management, and gerontology. ULM structures online courses in an eight-week format. Admission requirements include an associate degree or nursing diploma, unencumbered RN license, and a minimum 2.0 GPA. All distance learners pay the same tuition rate, regardless of their state of residency. NCAT touts academic excellence, a collaborative learning environment, and global outreach programs. Award-winning faculty engage in instruction and research in fields as diverse as nanotechnology, business, and the arts. Additionally, NCAT offers distance learning through academic, technical, and agricultural programs. The school's RN to BSN online consists of 13 required courses that full-time students can complete in 12 months. Part-time learners can also enroll, and typically earn their degree within two years. Unlike many RN to BSN online programs in the state, the curriculum incorporates study of informatics, interprofessional collaboration, and global health. Other course topics include applied ethics in nursing, evidence-based practice, and leadership and management in nursing. Admission requirements include an associate degree and RN license in North Carolina or a compact state. Applicants must also pass a criminal background check and drug screen in order to be eligible for clinical practice. Located in Georgia, Clayton State traces its roots to its establishment as a junior college in 1969. Today, the school delivers degrees at the associate, bachelor's and master's level in a range of fields including criminal justice, dental hygiene, and nursing. Distance learners can complete Clayton State's fully online RN to BSN full-time or part-time. Coursework includes classes in health assessments, pathophysiology, leadership and management, and interactive communication. Degree candidates seeking to earn their RN to BSN online must complete a 90-hour practicum, as negotiated with the nurse’s faculty advisor and a chosen preceptor. Admission requires an associate degree or nursing diploma, unrestricted RN license (or eligibility for such licensure), 45 core credits, and a minimum 2.0 GPA. Clayton State participates in the Georgia Statewide Articulation Model, which allows students to seamlessly transfer credits from participating institutions. Students at SUNY Canton explore applied learning techniques that prepare them for professional success. The school's virtual campus features 13 degree programs and more than 450 courses. Nurses with an associate degree can take advantage of SUNY Canton's 120-credit RN to BSN, wherein distance learners access and complete coursework asynchronously. Study topics include health assessments, pharmacology, the genome, community health nursing, and transcultural nursing. Graduates leave the program prepared to work in private practices, hospitals, research organizations, and pharmaceutical firms. Admission to the program requires an associate degree, 36 lower-division nursing credits, 27 credits of lower-division general education prerequisites (in subjects like English composition, microbiology, and anatomy and physiology), and an unencumbered RN license. Applicants to this RN to BSN online must have earned all transfer credits with a grade of C or better. One of the nation’s largest institutions of higher learning, OSU functions as a hub of academic achievement and innovation. The university offers 200 degrees on campus and through distance learning. OSU's online learning options include a 120-credit RN to BN, which allows RNs to keep pace with the dynamic nature of the healthcare industry. Available fully online, courses in the curriculum include study of contemporary issues for nurses, evolving concepts in leadership and management, and community health nursing. Among RN to BSN online programs, OSU's degree features a generous transfer system: degree candidates may earn up to 90 credits for previous coursework and need only complete 30 credits through the university. Admission requirements include an associate degree or nursing diploma, a minimum 2.75 GPA on all college work, and current RN licensure. GCSU provides its approximately 6,600 learners with a choice of nearly 40 undergraduate programs and more than 25 graduate degrees on campus and through distance learning. The school's 120-credit RN to BSN online builds upon the skills and knowledge of practicing RNs who hold an associate degree or diploma in the field. After completing the institution’s 60-credit curriculum core, degree candidates progress through courses that emphasize evidence-based practice, mastery of clinical reasoning, and the honing of a professional nursing practice. GCSU's RN to BSN coursework covers a variety of topics such as transitioning to baccalaureate-level practice, research in nursing, leadership and management, and community-based care. Admission requires a valid, unencumbered RN license, general education credits, compliance with the Georgia RN-BSN Articulation Model, and a minimum 2.75 GPA. The school offers financial aid options ranging from grants and federal loans to scholarships. Located in Louisiana, McNeese offers a multitude of undergraduate online programs in fields such as sociology and nursing. The school's College of Nursing and Health Professions uses state-of-the-art technology to provide students with hands-on learning opportunities in nationally accredited programs. These include a 120-credit RN to BSN for nurses with an associate degree in nursing and unencumbered RN licensure. Distance learners in McNeese State’s RN to BSN online study nursing informatics, leadership roles for nurses, community health nursing, and biomedical ethics and decision-making, among other subjects. Students who attended a community college or other institution in the state may use the state’s Master Articulation Matrix as a reference of credit transfer applicability. McNeese provides competitive tuition rates in addition to a full suite of financial aid options, making its program an affordable RN to BSN online. Georgia Southern provides learners with an environment that fosters scholarship, leadership, and service through nationally ranked programs and high academic expectations. Students can earn degrees at the bachelor's, master's and doctorate levels. Additionally, the school offers distance learning programs in the fields of education, business, and healthcare. Georgia Southern's RN to BSN online appeals to registered nurses seeking to enhance their clinical practice and earn credentials necessary for career advancement. Distance learners may enroll part-time or full-time and access course content in both asynchronous and synchronous formats. Coursework in the 31-credit RN to BSN includes study of health assessments, critical inquiry, nursing leadership, and community health nursing. Admission requirements include RN licensure in Georgia, a minimum 3.0 GPA, and an associate degree or diploma in nursing. In addition to financial aid opportunities such as federal loans, students in the program may be eligible for a scholarship administered by Georgia Southern's School of Nursing. Located 50 miles from Boston, Fitchburg State serves more than 6,500 students through degrees at the undergraduate and graduate levels. These include a variety of online programs, in fields ranging from special education and accounting to web development and nursing. Fitchburg State offers a multitude of services to its distance learners, including financial aid, a bookstore, counseling services, and career preparation assistance. The school's affordable RN to BSN online includes 62 credits in the nursing major. RNs can transfer a maximum of 30 credits from an associate degree into the program, while those students with a nursing diploma can earn 30 credits with a passing score on the National League for Nursing Acceleration Challenge Exam II. Applicants must have a current RN license in good standing and must have earned an associate degree or diploma in nursing with a cumulative GPA of 2.5 or above. Nurses offer care and a sympathetic ear to patients in a range of healthcare settings, from hospitals and physician’s offices to hospices and schools. Nurses need strong interpersonal communication skills for interactions with patients and doctors. A developed sense of empathy is vital for communicating with patients and families, and nurses must also be able to maintain stability through work that is often stressful and emotionally demanding. Pediatric nurses treat adolescents, children, and infants, commonly focusing on general care and strategies for good health and nutrition habits. They may assess and document children’s symptoms and assist pediatricians with patient examinations. Pediatric RNs also perform general tasks such as drawing blood, administering medication, and giving vaccinations. Also known as OB GYNs or perinatal nurses, obstetrics and gynecology nurses assist patients through all stages of motherhood, from pregnancy to postpartum care. OB GYNs offer emotional and physical support for new and expecting mothers and play an important role in the delivery process, coaching mothers through labor and providing initial care for the newborn. Working in intensive care units at hospitals and clinics, ICU RNs treat patients with life-threatening injuries, such as accidents, organ failure, or serious trauma. These nurses must exercise careful monitoring of patient conditions, which can change quickly in ICU settings. ICU nurses also communicate with patients’ family members and help them make decisions about treatment options, which can include end of life care. Hospice nurses offer care to terminally ill patients, helping them maintain comfort at the end of their lives. Typically working in private homes, residential facilities, nursing centers, and other palliative care environments, hospice nurses provide individualized attention to patients, creating a plan of care that helps manage pain and allows patients to die with dignity. After completing their RN to BSN online, many nurses choose to pursue a master of science in nursing (MSN), which can provide increases in career specialization, job opportunities, and salary. Nurses who earn an MSN typically choose a concentration that gives them advanced knowledge and skills in a specific field, such as pediatrics, oncology, or mental health care. These advanced skills result in higher salaries: PayScale reports that family nurse practitioners earn anywhere from $74,000 to $117,000 annually. Information Technology in Nursing Students gain an overview of computer applications commonly used for nursing and healthcare. Courses typically focus on information technology in relation to clinical practice and administration. Healthcare Ethics This course introduces theories, principles, and models of ethics in the context of patient care. Studies cover relevant areas in ethical decision-making, legal practices for nurses, and ethical dilemmas. Nursing Research Students develop research skills relevant to nursing and clinical decision making while exploring ethical, historical, and philosophical dimensions. Many courses require students to complete an original research project. Nursing Management and Leadership This course examines strategies of healthcare management, including networking, delegation of responsibilities, decision making, and conflict resolution. Students learn to motivate fellow healthcare professionals and to administrate a professional setting. Community Health Nursing Students gain the skills to promote health in individuals and community populations, with topics in disease prevention, community assessment, and health plan implementation. Some courses also involve a clinical/community experience. While earning an RN to BSN online can open more opportunities than just an RN alone, pay can still vary widely by position; graduates in management typically earn the most. This chart compiles data from PayScale that tracks the median salary of different nursing positions. While specialized nursing certification is not required for all nursing positions, it typically leads to increased career opportunities with higher salaries. Some specialized positions, such as nursing home administrator, may require professional certification. The following list details some of the most popular certification options for RN to BSN online students. AIDS Certified Registered Nurse This certification gives students the skills to address the physical and psychosocial aspects of HIV/AIDS, preparing them for work in infectious disease centers and specialty clinics. Certified Pediatric Nurse Nurses with this certification gain specialized skills for treating pediatric patients and offering health education to children, parents, and families. Advanced Oncology Certified Nurse This certification gives nurses extensive knowledge of cancer, including in-depth physiological effects and issues related to patient quality of life. Even if you’re enrolled in one of the cheapest RN to BSN online programs, paying for nursing school can be a challenge. There are plenty of financial aid options and other ways to fund your degree. By completing the FAFSA form, you gain access to federal funding opportunities in the form of loans, grants, and scholarships. If you’re already employed in a healthcare facility, your employer may offer career development programs that will pay for you to earn your RN to BSN online. You can also apply for the scholarships listed below, available exclusively to nursing students. Overview This scholarship, offered by the American Indian Science and Engineering Society, is open to students enrolled in an undergraduate medical sciences program. Eligibility Requirements Student must be a member of a recognized American Indian Tribe, Alaskan Native Village, or of Native Hawaiian descent, with a minimum cumulative GPA of 3.0. Overview The Oncology Nursing Society offers a scholarship that’s available to students in their senior year of a nursing program. Eligibility Requirements Students must be enrolled in an oncology program at either a NLN or CCNE accredited school. Overview Offered by the American Association of Colleges of Nursing, this scholarship is available multiple times each year. Eligibility Requirements Students must be enrolled in an AACN member institution and maintain at least a 3.2 GPA. Overview Awarded by the National Association for Hispanic Nurses, this scholarship is available to Hispanic students enrolled in any accredited nursing program. Eligibility Requirements Students must be of Hispanic descent and maintain a GPA of at least 3.0. Overview This scholarship is offered by Advancing Men in Nursing, specifically for male nurses. Eligibility Requirements Students must be AAMN members, submit an essay on prostate cancer, and give at least four public presentations about prostate cancer awareness.